Looking for genealogical online records can be like looking for needle in a haystack. Which haystack do you search? Which part of the haystack should I look in first? We’ve just released our first version of a new filtering feature. 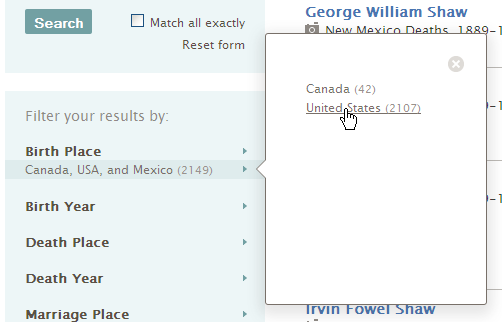 Many of you have commented that you like the way Record Search works. It supports a two-part search strategy. To figure out which haystack to search, you enter names, dates, places, and relationships. You analyze your search results, then use filters to find the specific set of records to search (to pick which part of the haystack you’ll search first). We added these filters first because they are the most popular in Record Search. We expect to add more filters later based on user feedback. On the search screen, enter information about the person you want to find, and click Search. Review your search results, and decide exactly what you want to find. Click the triangle that is next to the filter that you want to apply. A pop-up box listing subfilters appears. 4. Click the subfilter that you want to apply. 5. Keep applying filters and subfilters until you have what you need. You can select multiple filters. 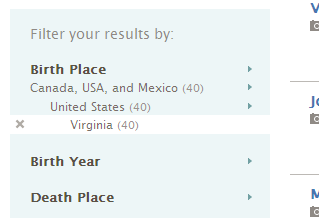 For example, you can filter by birth date, birthplace, gender, and category. You cannot, however, select more than one filter of the same type. 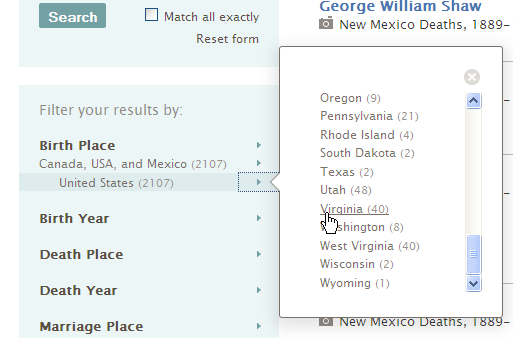 For example, you cannot select more than one birthplace filter (such as Virgina and North Carolina). We are exploring adding this feature in a future release. Your search results narrow to the matching records. The filters that you applied appear highlighted in white. To remove a filter, simply click the x that appears next to it. Click here to us know how and whether these filters help. We also welcome your ideas for other filtering features you would like us to add. Your feedback helps us improve this feature and the rest of FamilySearch.org.